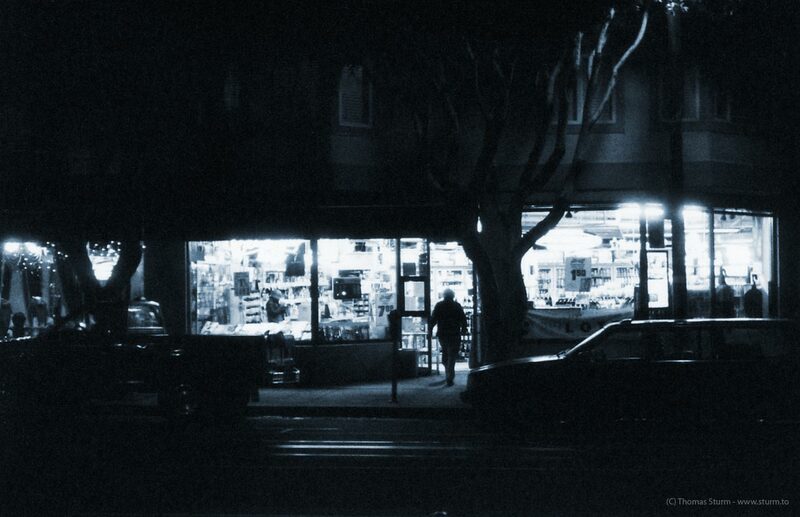 San Francisco is blessed with hundreds of little convenience stores and there is barely a block that doesn't have its own. Many of them are open late and they are often the last hope when the there are more party guests than expected or when that one crucial ingredient is running out while cooking late. I love those little stores, each with their own personality and idiosyncratic shelfing systems, and I've often tried to take photos of them, but I've found it very hard to take pictures that capture their unique presence. Here's a photo of a rather large convenience store on Columbus near Jones late one night on my way home from work. I took this shot with the Kodak Retinette 1A loaded with Kodak TMax 3200 film - a first for this camera that I had kept on a steady diet of color film for the last two years.